Mormon Mommy Writers and Friends: Mommy POWER! This week's post kind of snuck up on me, but it's because I'm very involved in another project right now: organizing my mind. If that sounds like a daunting task to you, you should know that it IS a daunting task- but I do have help. That help is coming in the form of Mind Organization for Moms, a program created by a group called Power of Moms. First, let me rewind and tell you about this group. Power of Moms is a very cool site/organization whose main purpose is to provide training and support for those of us doing the hardest and most important job in the world: motherhood! I had first heard of this site through Shawni Pothier's blog, 71 Toes. I think she's a cool lady, and I like a lot of her ideas and philosophies when it comes to motherhood, so when this group name popped up again on my radar, I took notice. It popped up in the form of a big discount being offered on a program they have called the "Power of Moms Learning Circle." The Learning Circle is a curriculum designed for groups of moms- basically, you gather your best mommy friends and each person buys the curriculum. Then, you meet once a month to discuss the article for the month- kind of like a book club/support group/moms night out. We've been doing ours now for 6 months and I LOVE it. We gather one evening each month and we share our struggles and our successes and everything in between. I have learned so much from the program and, most importantly, from the ladies in my circle. They are amazing! Lest I start sounding like a commercial, I should point out that the Power of Moms site offers a ton of free resources for moms as well. My favorites are the blog posts and podcasts- whenever I read or listen to one, I always feel like I've gained some insight and had some feelings validated, and I come away feeling refreshed and ready to tackle this big job I do every day with greater enthusiasm and determination. So anyway, right now I'm up to my eyeballs in this mind organization program, which is based off the book, "Getting Things Done: The Art of Stress-Free Productivity" by David Allen. At the moment it all seems extremely complicated to me, but the M.O.M. program assures me that once I get through this hard part of setting myself up for success, it will all be downhill from here. 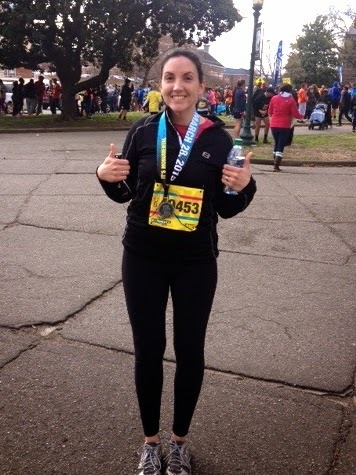 Speaking of power and success and downhills, I completed my THIRD 10k on Saturday! And I did it a heckuva lot faster than I thought I would! And it was FUN even! I think I was smiling the whole time, despite the fact it was in the 30's with below freezing wind chills. Of course, today my knees are totally on strike and my right hip has given me its official resignation, but just give me a few days- maybe a week- and I'm sure I'll have talked them all into running with me again.